My five year old golden retriever absolutely loves baths, and has for most of her life. I consider this a blessing. Having previously worked as a receptionist and assistant at for a dog groomer, I’ve seen the fights dogs can put up when they don’t want to be groomed. While I am not opposed to store-bought dog shampoos, I have a tendency to use homemade products on my dog. Sometimes this allows me to know exactly what I am exposing my dog to and other times, it just satisfies my love for DIY projects. In any squeeze bottle (if you don’t have something like a liquid dish soap bottle or shampoo bottle to recycle, you can find this at places like the Dollar Store), combine equal parts liquid dish soap and white vinegar. Shake gently yet thoroughly until the two ingredients are well combined. I save money when I make this DIY dog shampoo, regardless of what soap I use. Now I’ll be honest, sometimes I’ll pick up liquid dish soap on sale regardless of the ingredients and I’ll use that (for example, Palmolive) but other times I will gravitate towards the slightly more expensive, organic or green liquid dish soaps such as Attitude Dish Washing Liquid (I like their ‘Wildflowers’ scent) or the Honest Company Honest Dish Soap (in ‘White Grapefruit). Of course, my favorite product to use is Dr. Bronner’s Organic Pure Castile Liquid Soap (I prefer ‘Lavender’, ‘Peppermint’ or ‘Unscented’, though ‘Rose’ is nice, too). While I’ll admit, I do feel better when I use an organic product, I have never had a negative experience with this DIY. and I imagined if it smelled strong, it would feel strong on my dog’s skin. But after looking into this some more, my views changed completely. This DIY dog shampoo is extremely gentle on dog and human. I mean it - after bathing my dog with this, my hands are so soft. More importantly, my dog’s fur, in addition to having a beautiful shine, is soft and fluffy - it’s like puppy fur again. The first time I used this on my dog, she was suffering from dry, itchy skin. Thankfully, this is no longer an issue as we have switched her diet, but at the time, I noticed immediate improvement when I used this shampoo. She wasn’t scratching as much. I want to stress that when I used this for ’skin problems’, my dog only had dry, flaky skin. There were no open wounds or raw spots. I know I have said that this is gentle, but something tells me that if it were applied to serious skin irritation, it could be painful. concern because I’ve since grown to like the smell of white vinegar. But for those of you who don’t enjoy the smell of white vinegar as much as I do, I have good news - once your dog is completely dry, the smell of vinegar disappears completely. This shampoo is an effective deodorizer. Compared to all the other shampoos I have used on my dog, I find with this DIY that the wet dog smell during the bath is not as strong. I have also noticed that after using this shampoo, she doesn’t get that wet dog smell if she goes out in the rain and gets a little damp. If she goes out in the pouring rain, chances are she’ll come in with a slight smell but it’s not nearly as bad as if I didn’t use this shampoo. Unfortunately, this is only true for the first week or two following her bath. majority of her body but I will squirt it into my hand so that I have control when washing around her head. After rinsing well, you can either towel dry or blow dry your dog. Again, I am blessed with a dog who loves to be groomed so I prefer to blow dry her. Regardless of what shampoo I use on my dog, I find blow drying gives us the best results. 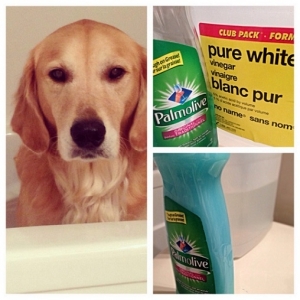 As I said, prior to trying this DIY, I had seen Palmolive liquid dish soap used to kill fleas. If your dog has fleas, let this shampoo sit for approximately five minutes after lathering to suffocate the fleas and then rinse well. Depending on the severity of the infestation, you may want to repeat this process. Although I love trying new products (homemade and store-bought) on my dog, this is a DIY that I have returned to several times and will certainly make again. Of course, I am happy to recommend this DIY to other dog owners. However, I want to stress that just like people, dogs can have allergies and sensitivities. When trying any product on your dog, be sure to monitor them for any sign of reaction. I strongly agree because it’s cheap and it works as effective as those expensive shampoos, in my opinion I don’t see why is everyone not using it. I have used DIY dog shampoo for a few years now, and I absolutely love it. Of course just like with any product, you have to be careful to insure your pet doesn’t acquire any side effects from the product or ingredients you are using. I not only save a ton of money, but my dogs fur is soft and silky and his skin isn’t dry anymore from those per-fumy dog shampoos. I would highly recommend DIY dog shampoo. First, make sure your checking the ingredients. You never know what may irritate your fur baby. But, If you want to make a great home made soap, make an oatmeal soap. Always check ingredients and know thy fur baby. As soothing as oatmeal can be for many, I have a dog who doesn’t do well with shampoos/soaps that contain oatmeal.